Welcome to my Unblogged Files for August! Now, before I get into my usual blabber about the month gone by, you'll notice that things have changed a little around here - new layout, new header, and a whole lot of little tweaks that will hopefully make your reading experience here at Sarah Cooks a whole lot cleaner and easier! Thank-you to those who have already commented saying that they like the new look! I didn't draw the pictures myself (hah, as if I could be that talented! ), but I actually commissioned an artist to create the pictures, and we held a couple of "Art and Food" days where I cooked, she drew, and a whole bunch of friends ate! I'll be talking about the whole process and the new layout in detail in my next post, so stay tuned. 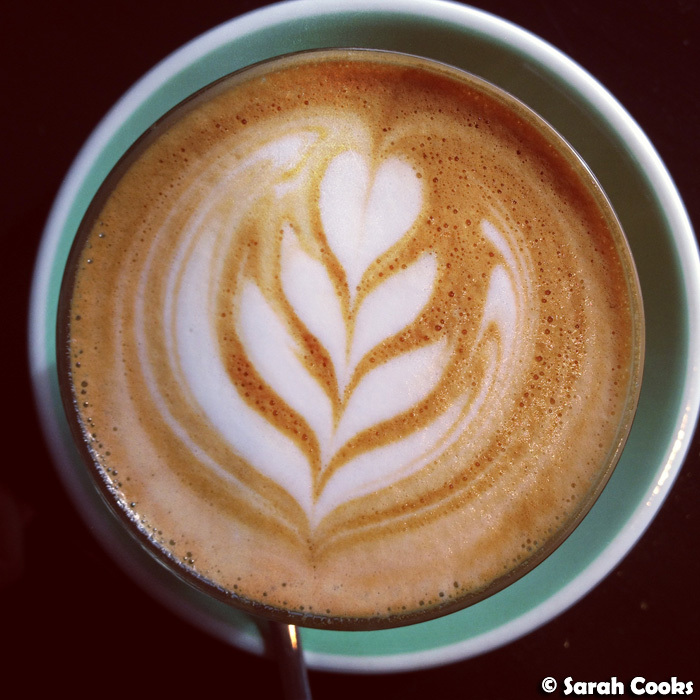 I caucht up with my cousin at Prospect Espresso (2A Prospect Hill Road, Camberwell VIC 3124) one morning. She was post-workout and I was pre-workout, so she had a proper breakfast and I just had a coffee. I was super jealous when her breakfast roll came out, though - how good does it look? 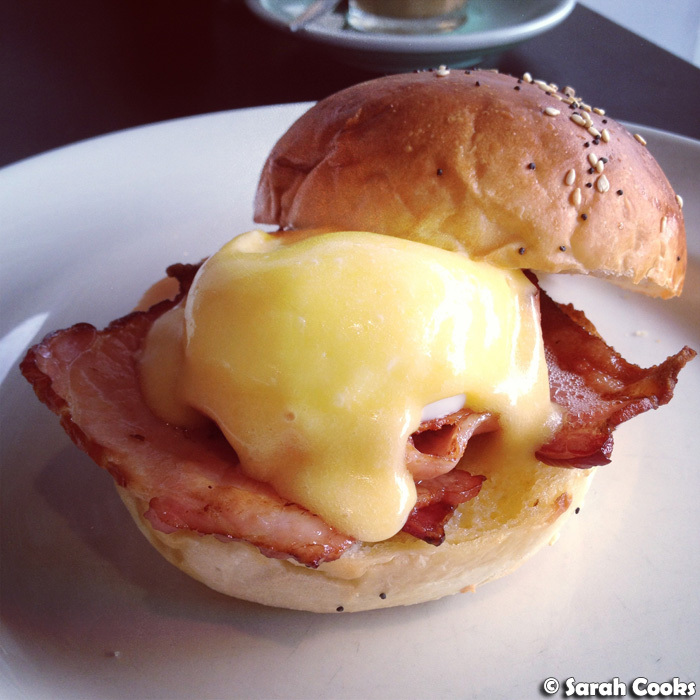 We caught up with girlfriends at the Meat and Wine Co in Hawthorn East. 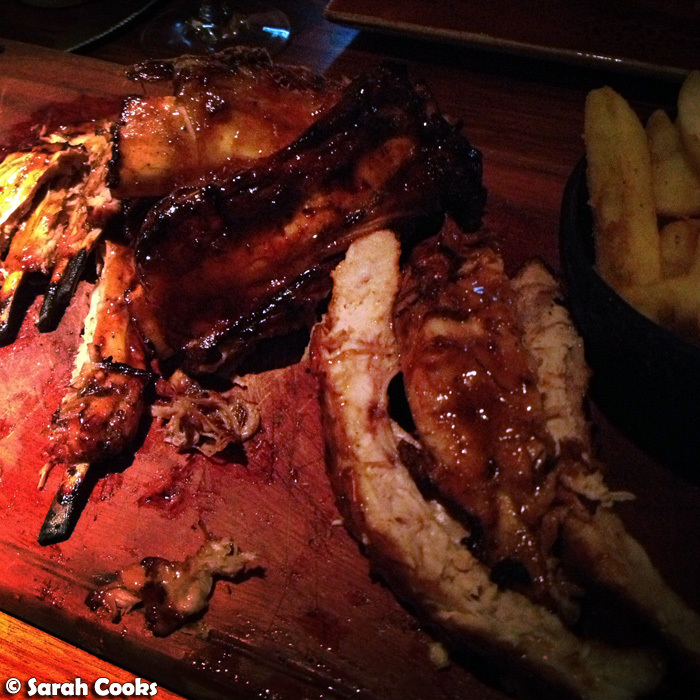 We shared a platter of mixed lamb, beef and pork ribs. OMG - the pork ribs, amazing. It was a bit of a pricey dinner, but it had a great atmosphere and I'd happily go back for a treat. Funnily enough, that same day I got an invite to the relaunch of their Southbank branch, which happened later that month. Hoping to blog both visits! We had a dinner party one night for some friends, who brought their super-adorable new baby - yay! 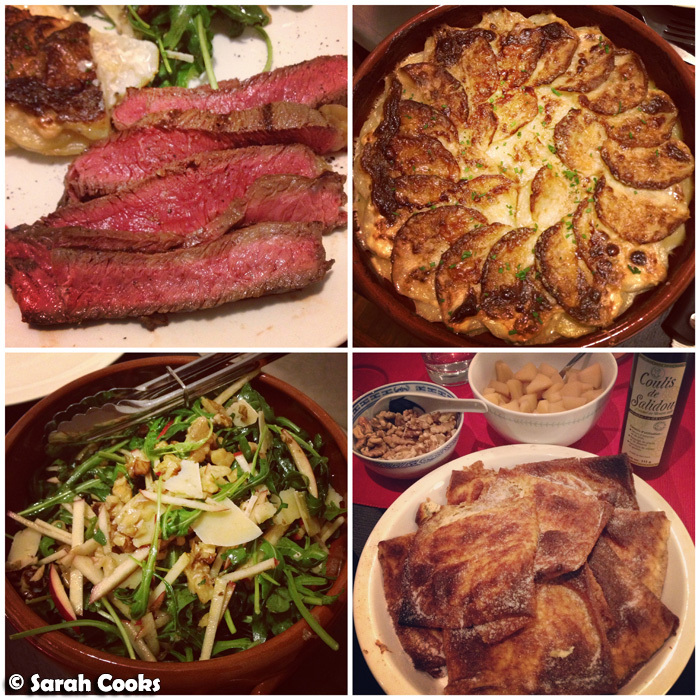 The menu was Nigella's tagliata of beef, Martha Stewart's scalloped potatoes with leeks, a salad of rocket, apple, walnuts and parmesan, and a dessert of mascarpone-stuffed crepes with calvados apples and that Bretagne salted caramel sauce I brought back from Paris! I really liked the crepes, even though I mainly winged the recipe. I'm going to work on the recipe so I can blog it and share it with you. I keep making variations on Japanese salmon and noodles for weeknight meals, especially when I've been eating quite heavily, hehe. 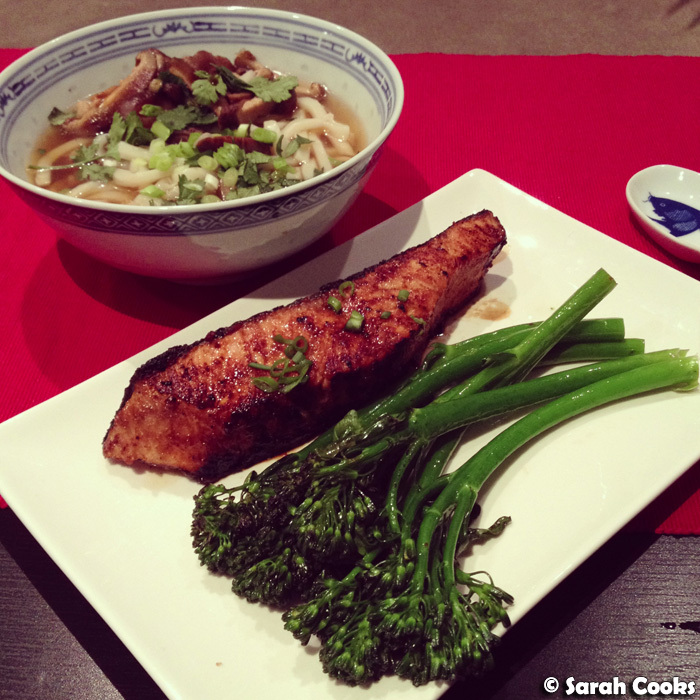 Here's one I did this month - miso glazed salmon with boiled broccolini, and udon soup with shiitake mushrooms. We caught up with friends D&M for, well, a D&M over afternoon tea. They outdid themselves, making romkugler (Danish rum balls), mini tarts filled with passionfruit/white chocolate and bergamot/dark chocolate, and affogatos. 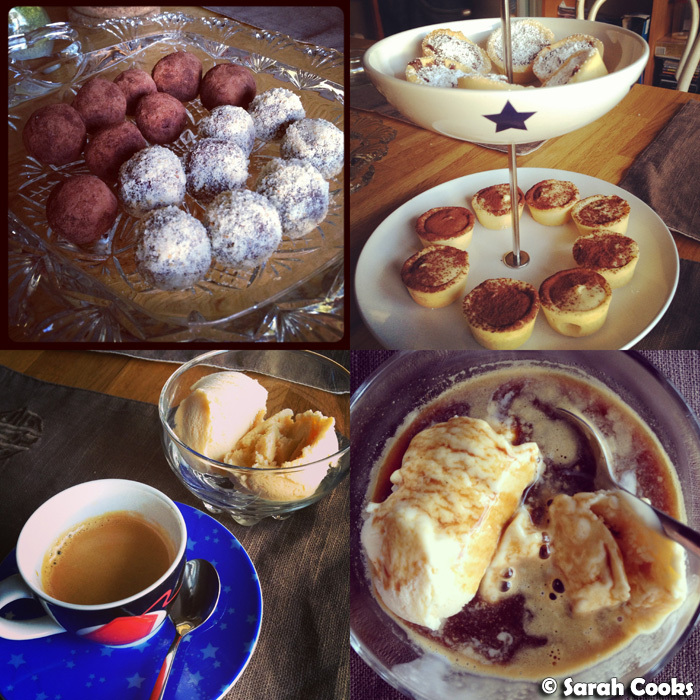 After not baking for what feels like ages, I went on a bit of a baking bonanza this month! Apart from the maple walnut cupcakes with maple buttercream, I baked madeleines three times (one batch honey, one burnt butter and honey, and one with éclats de caramel au beurre salé). One night I suddenly decided I had to use up all the frozen bananas in my freezer, and made Bill Granger's fabulous choc chip banana bread. Love it! 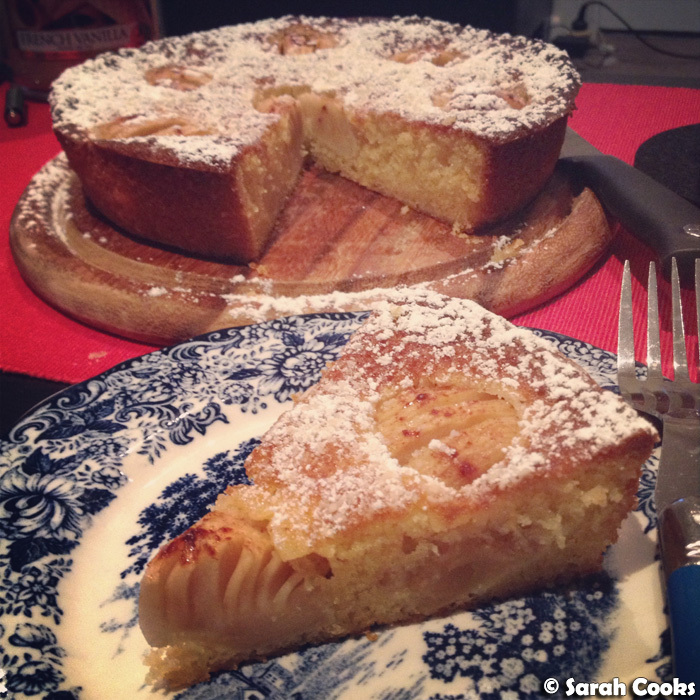 At the same time, I baked an Apfelkuchen sehr fein because Sandra doesn't eat bananas and I'm super nice like that. We took a weekend trip to Hobart. 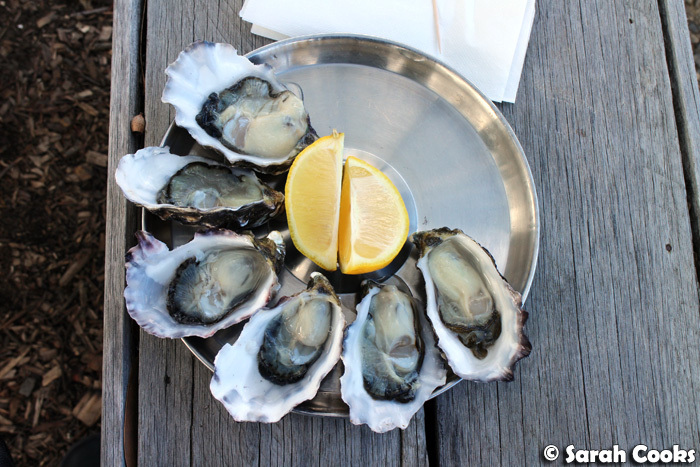 These delicious oysters from Bruny Island totally happened. Blogposts to come! 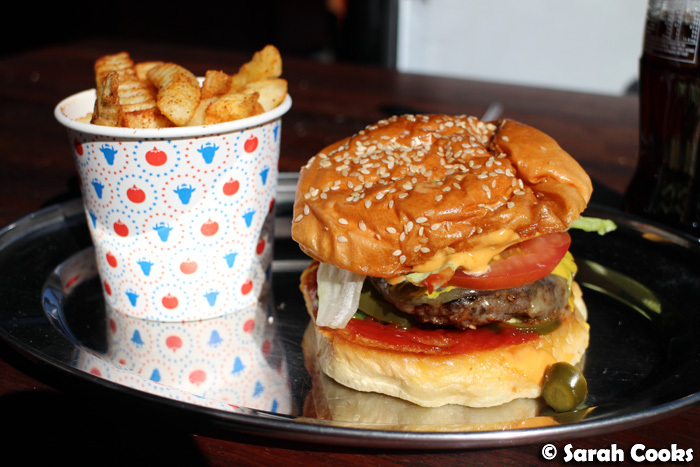 Last weekend, when the weather suddenly burst into sunny Springtime, I finally tried Huxtaburger! I loved the Denise (the hot one, with sriracha mayo and jalapenos), especially the buttery bun. However, Sandra thought the Theo (double patty, bacon double cheese and BBQ sauce) didn't live up to the hype, finding it too messy to eat and overpoweringly smoky from the BBQ sauce. I don't think I'd go out of my way to visit again, but certainly wouldn't say no if friends suggested grabbing a quick bite there! That was August! Plans for the month include a little road trip, a couple of nice meals, a lot more baking and having friends over for dinner. And (fingers crossed) enjoying the warmer weather! 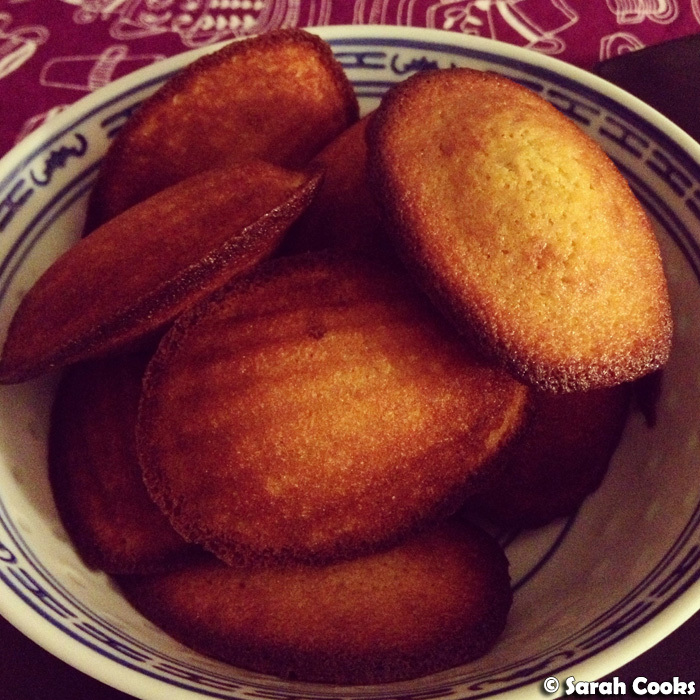 I love madeleines, okay? Gosh. Since when is that a crime?!?!?! YASSS to Bruny Island oysters and Huxtaburger! Can't wait to see the Tassie posts! I was going to say something about the new header a few days ago actually - I love it! 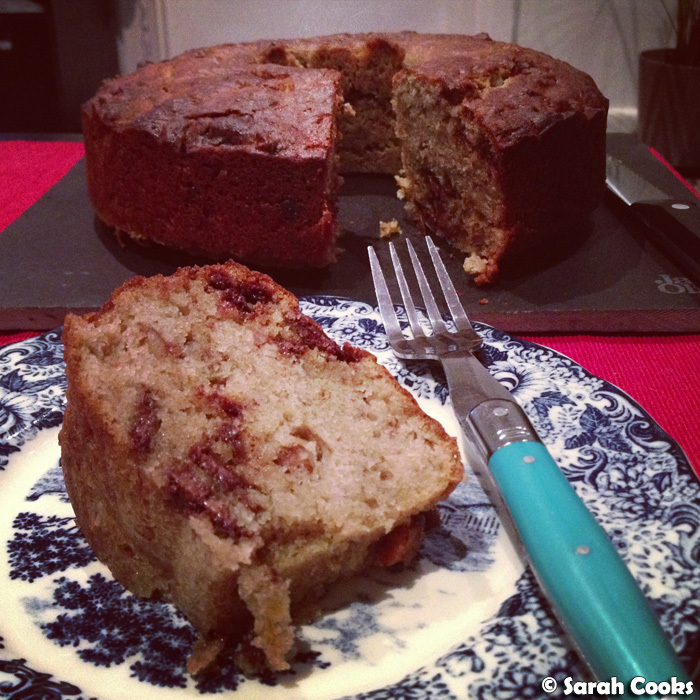 I just made Bill Granger's choc banana bread - how good is it? !